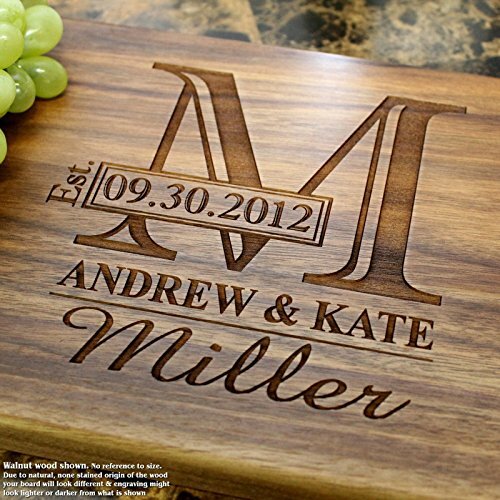 • Our personalized cutting boards are engraved with a beautiful design of your choice. • They make a perfect gift for a family, couple, friend, or maybe that special someone in your life. Surprise others with a unique wedding, anniversary or housewarming gift. Show your appreciation with a one of a kind party favor for your bridesmaids or groomsmen, friends, or family members. In addition, a personalized cutting board would make an excellent corporate gift for a business partner or a prospective client. • Each and every board is made from a high grade natural wood. All boards are made by us in our own shop and carefully checked prior to the engraving process. Personalization is achieved by using the state of the art laser engraver. Last, but not least, each board is completed by application of Straga Cutting Board Butter for the board's protection; therefore, you get a fine-looking FINISHED cutting board! • We do not include invoices or receipts in the package. • HOW TO ORDER: Click on "Select Options" and enter your information in each drop-down menu making sure to read the instructions very carefully. The "Required" fields have to be filled out in order to proceed with your purchase. Please make sure to double-check all information, including spelling, dates, grammar, and punctuation entered as we copy and paste your information into our templates. If you have special characters you want engraved, please send us a message before placing your order to ensure we're able to accommodate this request. • See our "Terms of Sale" below. If you have any questions about this product by Straga Cutting Boards, contact us by completing and submitting the form below. If you are looking for a specif part number, please include it with your message.